A vicar has stepped down as a school governor after kissing a primary pupil on the cheek to congratulate her. 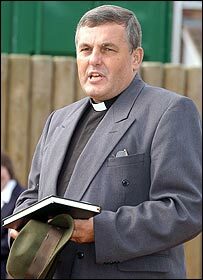 The Rev Alan Barrett, vicar of Tamworth, Staffordshire, kissed the girl in front of pupils and teachers because she had done well in maths. A church spokesman said a police inquiry found no offence had taken place, but the vicar was told to have no contact with the school. Mr Barrett said he was stunned to be subjected to a police inquiry. In a statement he said he had helped some pupils with class work and congratulated one who had struggled.
" I was stunned to hear I was subject to a police and social services investigating, examining my character, conduct and ministry," he said. "I was relieved when they found there was no case to answer and I could continue with my life." He said he agreed with the Archdeacon of Lichfield, the Venerable Chris Liley, that "even giving a child a kiss of congratulations is inappropriate in this day and age". A spokesman for the Diocese of Lichfield said an informal investigation conducted by the archdeacon found that formal disciplinary proceedings were not justified. But the investigation did deem the vicar's behaviour as "inappropriate" and sought assurances from him that he would not do it again. The diocesan spokesman said: "The conclusion that Mr Barrett had acted inappropriately is not a finding of guilt or negligence, but recognition that in today's climate, previously acceptable innocent behaviour is now subject to misunderstanding and suspicion. "As the complaint and subsequent police investigation demonstrates, the simple act of a kiss on the cheek - a common greeting throughout the world - has potentially damaging consequences. "The bishop of Lichfield has written to the mother of the girl setting out the steps the diocese has taken and the conclusion of the investigation. "He has explained that if the mother still feels that the conduct warrants a formal investigation she may lodge a formal complaint under the clergy discipline measure." The spokesman added the diocese took child protection very seriously and had policies in place which all parishes were required to abide by.